These pottery plates are handmade by Linda Bloomfield in her west London studio. She throws her products on the wheel in English porcelain. Linda’s life as a former scientist draws her to experimenting with – and making – her own glazes. Two sizes of these porcelain plates offer uses for everyday and special occasions. The small plate is ideal for a salads or starter, and serve lunch or dinner on the medium plate. Nigella Lawson used these beautiful matt white plates in her book Nigella Express, to serve mirin-glazed salmon and breakfast bruschetta. The macaron glaze colours give your food a unique look and have proven popular among food bloggers and wedding stylists. 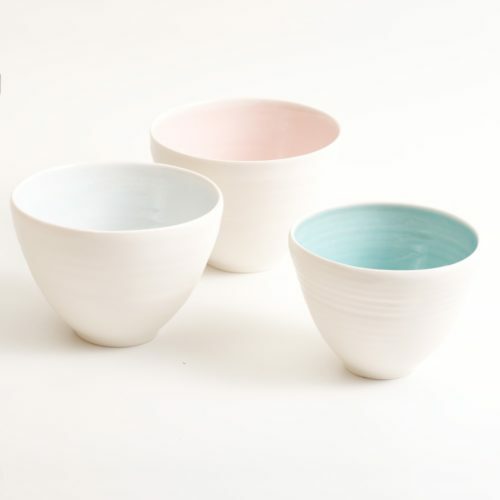 Linda Bloomfield’s ceramic tableware and homeware all looks great together in a unified look with complimenting colours. So see the full tactile collection, click here.